It’s too bad most people don’t think of San Francisco beaches when they plan a trip to the Bay Area. They should! While it’s not so much about “fun in the sun” here as it is at southern California beaches, the Golden Gate National Recreation Area offers some of the most amazing public beachfronts in the world, and San Francisco visitors would be remiss not to enjoy them if time allows. Beginning where the Golden Gate Bridge lands in San Francisco and moving east, our first stop is the Marina district, one of our favorite San Francisco neighborhoods. At the Marina Green, you’ll often find people flying kites, picnicking and just enjoying a wonderful vista of the San Francisco Bay. We should note that fog can be an issue and can affect your enjoyment of San Francisco beaches, especially during the summer months. Typically it burns off by mid-day, but fog has been known to stick around in the Marina district beyond that arbitrary clearing point. Walking west from the Marina district, past the boat marina itself, you’ll find the “Golden Gate Promenade” — a paved path through the old Crissy Field area that goes all the way to Fort Mason at the base of the Golden Gate Bridge. This is perhaps the most picturesque walk in all of San Francisco and one you’ve likely seen in films and on postcards. It’s truly breathtaking. Although swimming and surfing is allowed at San Francisco beaches, the water here is cold, so wetsuits are essential. Most people are content to simply enjoy the stunning views on foot or bicycle. East of the Marina district you’ll find North Beach, but this is actually inland and there’s no beach there. Now it’s mostly restaurants and hotels, but Aquatic Park Beach, located just west of the Fisherman’s Wharf and Pier 39 tourist area, is nearby. You’ll find a small but picturesque sandy beach there and a little pier that juts out over the bay. Moving now to the west side of the Golden Gate Bridge, you’ll find Baker Beach and China Beach just off Lincoln Boulevard. You can climb down to them on the California Coastal Trail (aka “Lands End Trail”) from Lincoln Boulevard. These San Francisco beaches are on the Pacific Ocean itself and, while typically warmer, the waters are treacherous and should be enjoyed from afar. Follow the trail west, to the Eagles Point Overlook and further west to the tip of the San Francisco Peninsula at the famous Cliff House Restaurant. Stop at the Sutro Baths ruins as you head south and you’ll quickly land on The Esplanade and Ocean Beach — a long, undeveloped beach that offers approximately five miles of peaceful surf and sand. Surrounded by this much stunning nature, it’s hard to believe you are in the middle of a huge metropolitan area. At the southern border of San Francisco County, near the city’s zoo, you’ll find Fort Funston – an old artillery outpost once charged with protecting the Golden Gate. It’s now a wonderful bluff and beach area, with easy parking. It’s popular with picnickers and hang gliders and also one of the area’s few off-leash beaches, so friendly canines are welcome to enjoy it, too. On the Marin County side of the Golden Gate Bridge, there are some wonderful beaches. Check out Horseshoe Bay at the old Fort Baker (take the Sausalito exit off 101 and then turn left on Bunker Road). As you travel up Rt. 1 through Marin, there are two small beach towns worth checking out: Muir Beach and Stinson Beach. Both have motels, camping, surfing, fishing and other amenities. 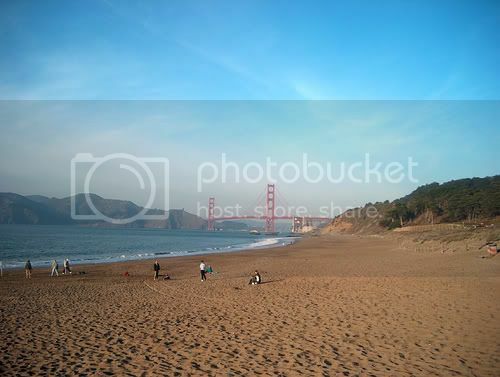 Photo of San Francisco Beach by TheFriendlyFiend via flickr (Creative Commons).